Ura Sunday's Twitter account has announced that Mob Psycho 100's mangaka ONE will start publishing a spin-off manga titled Reigen on Ura Sunday's Manga ONE app on March 19. 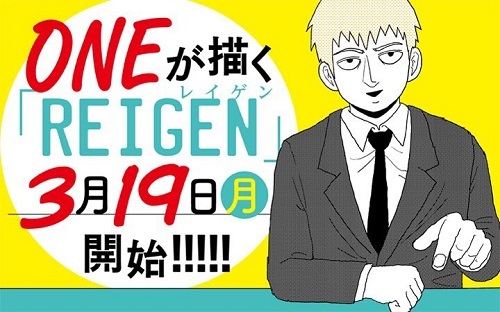 The spin-off manga will be centered on the character of Arataka Reigen. Mob Psycho 100 published via the Ura Sunday manga app from April 2012 to December 2017 for total of 16 volumes. Studio Bones animated the manga's adaptation, which broadcast in Summer 2016 for 12 episodes. Its recap movie, centering on Reigen, was screened on March 18. It also received a TV drama and stage adaptations this year. Compiled volume released today. Including unreleased chapters. I wasn't really interested in picking up the Mob Psycho 100 manga, but this Reigen spin-off I might read! First the announcement about the second season of Mob Psycho 100 and now we get a Reigen Spin-off. can someone tell me when this will be added to DB? or how to request to add it? The master deserves his own manga. Welp, I guess Reigen is the most popular character. So now what. Will he ever resume writing one punch man? @Libuhover I'm aware of the news, but I've been waiting for a reliable source before posting it. I'm sorry for the delay, it's here.